When you're adding people to a rota in ChurchSuite, you'll be warned if a clash will occur. There are two types of clash that you'll be alerted to - unavailability clashes - where the person being added to the rota has recorded unavailability on that rota date and time - and date clashes - where the person being added to the rota is already serving on one or more rotas on that same rota date and time. For each clash notification you can choose to cancel what you're doing and then resolve the clash; or you can override and accept the clash and resolve with them later. As we all know, some clashes are perfectly acceptable and inevitable - people might serve in the refreshments team before a service but also be part of the set-up team before that. Then they may be in the worship team during the service and finally go out and lead a youth group after worship! Ordinarily, all of these overlaps of serving on teams may give rise to a clash. 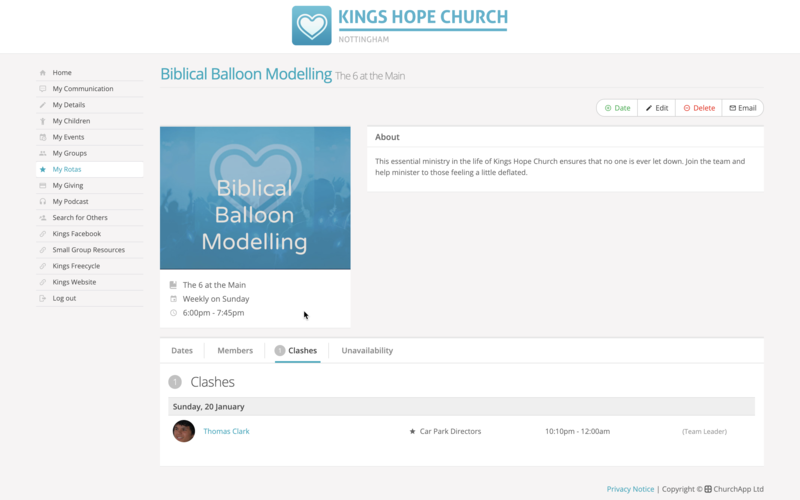 It's great when people serve like this, so ChurchSuite helps you manage all these scenarios. 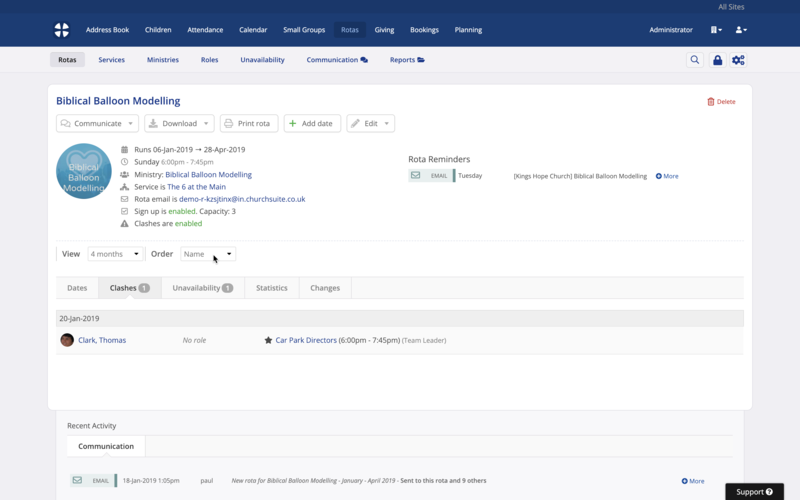 You can reduce the number of false clashes detected by setting each rota's serving times to more accurately reflect the actual times of serving within each of your services. If your morning service generally runs from 10.30am to 12pm on a Sunday, it is tempting to set all your Sunday service rotas to run for those times. 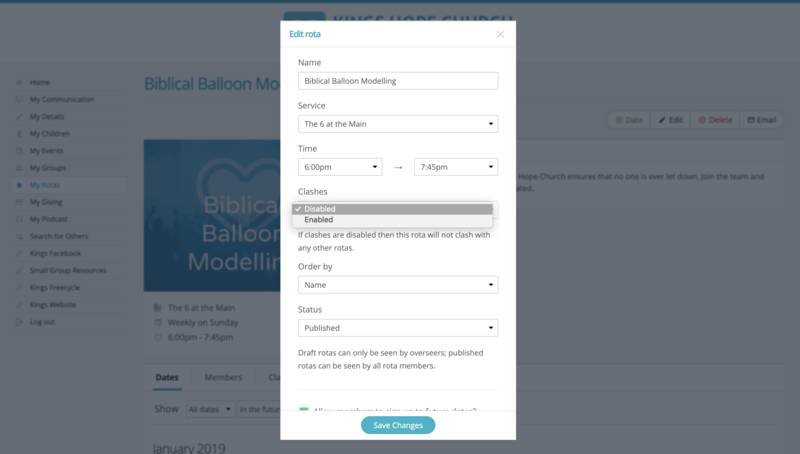 However, although you might mention the Sunday service time in a rota name, we encourage you to set more precise serving times when adding rotas. Careful consideration of serving times will allow people to serve in multiple areas on a Sunday without a false clash being notified when adding people to rotas. It is also possible to disable date clash detection on certain rotas - see later in this article. ...and you can view all clashes across all your rotas using the Clashes report in the Rotas module's Reports section. The rota Clashes report can be filtered by particular Ministries or Tags within a given range of Dates. This report is designed to provide everything you need to decide whether any action is required by you or your ministry overseers. For example, in conjunction with the Serving Frequency report you may look at this report and identify people at risk of "serving fatigue"; those who are simply doing too much! Or it might highlight bottlenecks that could be avoided if additional people were recruited in to share the load. Helpfully you can see the status of affected rotas (draft/published) and the roles of the affected serving team members. Please remember that this report is intended to be a decision-making tool - the clash detection functionality is not intended to be a mechanism that prevents you from adding people to a rota. if activated in your Rotas module settings, process "rota swaps" when they can't make one or more of their rota assignments e.g. when they're going to be on holiday (but only if the swap doesn't result in creating a clash for the person they are swapping with). When rota members are recording a rota swap, they are prevented from recording the swap if it will result in a rota clash for someone else. In these circumstances the rota swap must be processed in ChurchSuite by a Rotas module user or by the ministry overseer in My ChurchSuite. This is intended functionality to prevent team members causing rota changes that have unhelpful "knock on" effects to other people or ministries. However, rota members are able to process swaps or sign up to rota dates that result in a personal clash - in this scenario a notification is given and we assume they will not create a clash for themselves without having a plan to resolve the clash! The My Rotas section of My ChurchSuite includes a helpful clash summary for ministry overseers. 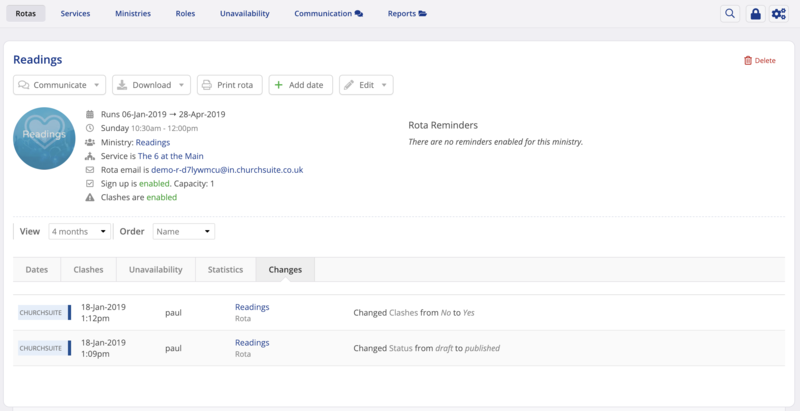 Within the rota for each ministry that they oversee, selecting the Clashes page displays a list of all clashes, showing the rota dates within the rota and the clashes that arise from other rotas. Under 18 team members are shown with a 'child' icon. The report also helpfully shows the rota status (if the rota is 'draft', for example) and the roles of team members on those rota clash dates. 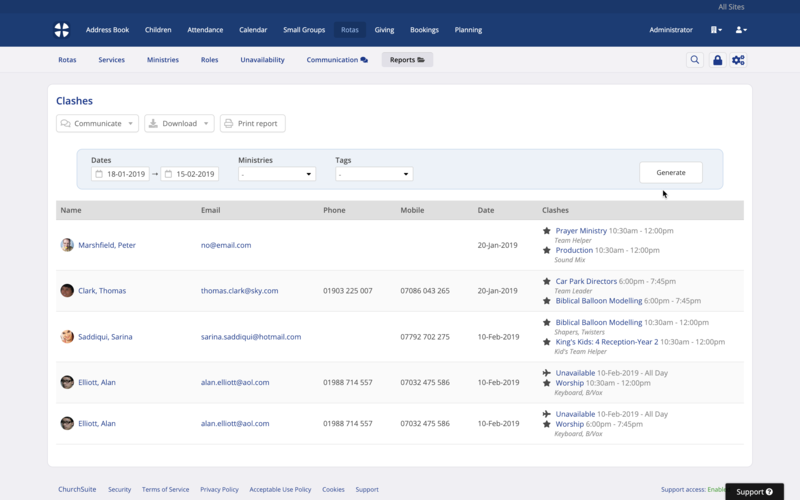 Clicking on a rota member name in the Clashes page will display their contact details, so overseers can easily get in touch with the person to resolve the clash (subject to the visibility settings of each team member). It's sometimes the case that you have a rota for which clashes will always arise that are not genuine clashes that you need to be notified of. For example - a Communion rota or Readings rota that serves part way through a service - it's entirely possible for these rota's members to participate in other rotas for the same service and be on the Communion or Readings rota and for it not to cause a real clash - people can do multiple things in a service! When adding a rota there's an option on the Add rota page to enable or disable Clashes for that rota. If clashes are Disabled, the rota will not generate date clashes (normally shown in red) with any other rota serving at the same time. Unavailability clashes, shown in red strikethrough, will of course continue to be shown on all rotas. On the Edit rota settings page, set the Clashes to Enabled or Disabled as required. Click Save Changes. A rota Changes log is recorded, so you can always see who has made changes to rotas and rota settings, and when. 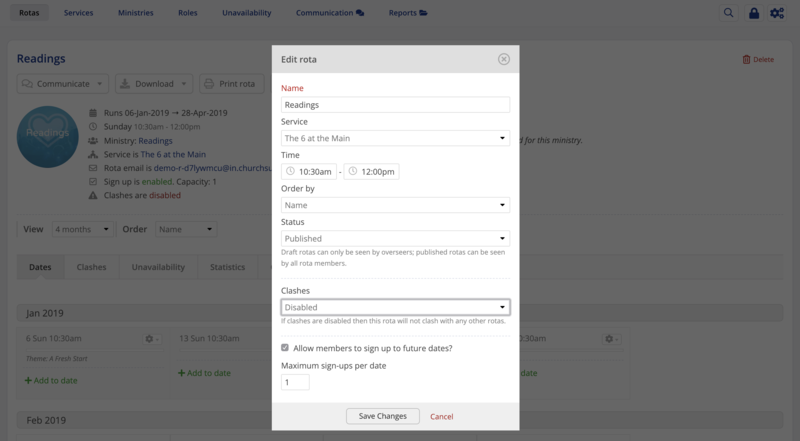 When ministry overseers are adding a rota in the My Rotas section of My ChurchSuite, there's an option to enable or disable Clashes for that rota. If clashes are Disabled, the rota will not generate date clashes (normally shown in red) with any other rota serving at the same time. Unavailability clashes, shown in red strikethrough, will of course continue to be shown on all rotas. 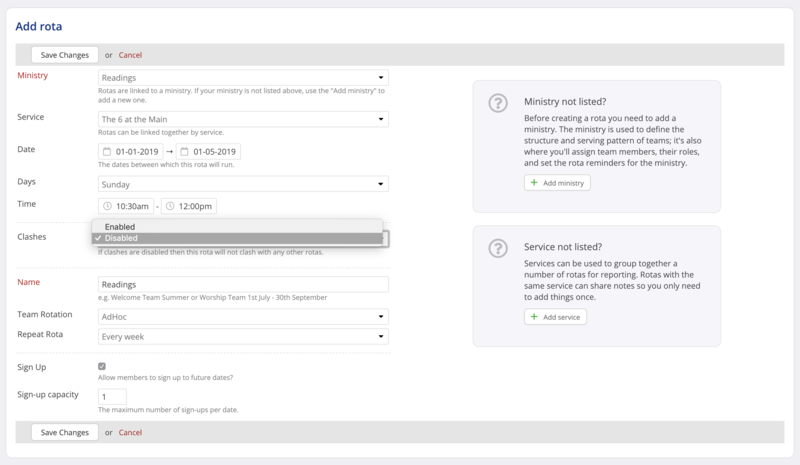 A ministry overseer can also change a rota's Clashes status at any time by editing the rota. Click the Edit [rota] button at the top of the rota page.